Publicist Max Clifford was branded by some as a purveyor of sleaze. Rarely away from media attention, he became as famous as the celebrities he represented. He grew wealthy on the proceeds but claimed his real motivation was his hatred of hypocrisy in public life. But he found himself on the receiving end of unwelcome publicity when he was jailed in 2014 after being convicted of offences of indecent assault. Maxwell Frank Clifford was born in Kingston Upon Thames in Surrey on 6 April 1943, the son of an electrician. The family struggled financially, not least because of his father's alcoholism and gambling. He left school at 15 and survived just four months in his first job at a department store in Wimbledon before he was sacked. His brother Bernard was active in a print union and secured Clifford a job at the Eagle comic as an editorial assistant. When the comic moved to new premises, Clifford took redundancy, bought a house and went work as a journalist at the South London Press, long seen as a nursery for aspiring Fleet Street hacks. After a few years he got a job in the press relations department of record company EMI. He was the only journalist in the department and he claimed he was called on to help launch the career of The Beatles. He moved on to work for a PR company, where he handled the singers Paul and Barry Ryan and met their stepfather, who represented Frank Sinatra. At the age of 27 he started his own company, looking after UK press for big names like Marlon Brando, Marvin Gaye and Muhammad Ali. But it was a somewhat less exalted performer who brought Clifford national publicity. Comedian Freddie Starr was looking to drum up coverage for a forthcoming tour. Clifford invented a story about Starr making a rodent sandwich after a late-night gig, spawning the Sun's famous headline Freddie Starr Ate My Hamster. The day after he arranged a photograph with Starr holding a hamster, which was dubbed Sandwich for the occasion. Clifford went on to handle numerous kiss-and-tell stories including the 1989 case of Pamella Bordes, who had been dating an arms dealer, a Conservative MP and a newspaper editor at the same time. It later emerged that he had fed the story to the News of the World to take the pressure off a brothel madam who was being investigated by the paper. High-profile clients came to him because of his excellent connections in the tabloid press - while journalists turned to Clifford to provide stories. He spun the untrue story that David Mellor, then Secretary of State for National Heritage, had made love to the actress Antonia de Sancha while wearing a Chelsea football kit. Clifford, who identified himself as a socialist, saw the tale as part of his campaign to destabilise John Major's government. He was behind many of the tabloid scoops of the following decade. In one month alone in 1999 he brokered three stories that dominated headlines - Lord Archer's perjury, Cherie Blair's pregnancy and sexual allegations against Gary Glitter. He represented Mohammed Al Fayed following the cash-for-questions scandal in which the Harrods owner had paid Tory MPs to ask questions in the House. He later paid damages for defamation to Neil and Christine Hamilton after a client falsely accused them of sexual harassment. Clifford usually managed to work on both sides of the fence, protecting his clients' interests while making sure the press got the sensational lines they demanded. His own website, which solicited stories from the public, said Clifford was "often poacher and gamekeeper at the same time". Inevitably he upset people. He received death threats over his dealings with the five men who were suspected of the killing of Stephen Lawrence. Clifford always maintained he had not represented the Lawrence suspects, but simply put them in touch with TV journalist Martin Bashir. In 2006 he represented Tracey Temple, the secretary who had engaged in a two-year affair with Labour politician John Prescott. He sold her story to the Mail on Sunday for a sum he described as "an awful lot more than £100,000". He sometimes took on cases for no reward. He helped two National Lottery players after they mislaid their winning ticket and lost out on a £3m prize. His experience of bringing up his disabled daughter, Louise, made him critical of successive governments' health policies - and keen to expose political hypocrisy. But he insisted he held back on more than 30 stories about politicians because he could not see any wrongdoing. In 2007, he was diagnosed with prostate cancer, but did not speak about his condition until he had undergone treatment. Clifford's relationship with the reality TV star Jade Goody began in March 2008, as she prepared to take part in the Indian version of Big Brother. The news of Goody's cancer diagnosis arrived during her stay in India and Clifford handled every aspect of the story. "It's unique," he told the BBC after Goody's wedding. "It's one of those things that is largely or virtually entirely media-led. I've never phoned anybody." As Goody's spokesman, Clifford fielded inquiries about her deteriorating condition with remarkably frank answers. He brokered a deal with Living to make a series of television programmes about her after her diagnosis. And he secured £700,000 from OK! magazine for picture rights to Goody's marriage to Jack Tweed. In December 2012 he was arrested by police as part of Operation Yewtree, set up following the revelations about the DJ Jimmy Savile. He was charged with two offences of indecent assault. Four months later he faced nine more such charges including one involving a 14-year-old girl in 1966. He robustly denied the charges, claiming they were completely false. "Anonymous people have made accusations from a long, long time ago," he said. "They are without any foundation." In the event, in May 2014, Clifford was convicted of eight offences of indecent assault against four victims and sentenced to eight years in jail. During the trial he had dismissed his victims as as "fantasists" and "opportunists". His appeal against conviction was rejected by the Court of Appeal six months later. 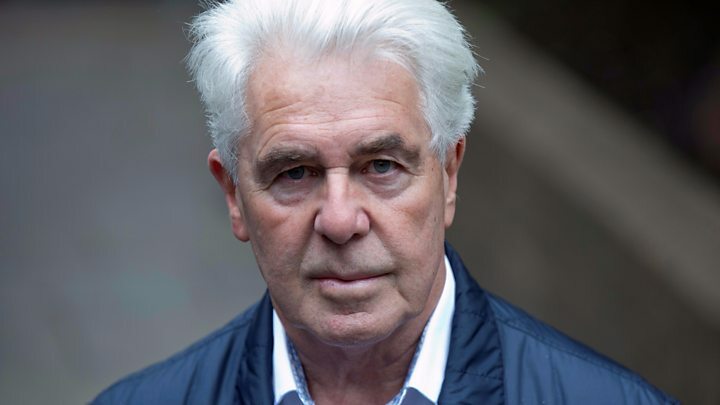 Max Clifford admitted much of his role was stopping information about his clients getting into the public eye - giving him leverage for future deals. "Every day, every week, every month," he once proudly told the Oxford Union, "a lot of the lies that you see in the newspapers, in the magazines, on television, on the radio, are mine. "